Allison comes from the international contemporary art world. 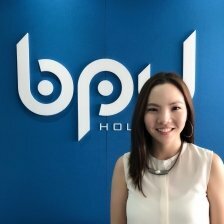 Having 10 years in the field as a Contemporary Art Advisor and Art Specialist, her transition to BPU Holdings and AEI technology proved to be a unique and commonsensical transition. Artificial Emotional Intelligence (AEI) emulates how people feel. Fine art is no different in understanding clientele’s emotions and reactions as part of the business deal. AI now having the ability to recognize consumer buying and selling patterns proves to have leverage in the way individuals and companies do business. Allison’s knowledge and global experience has been essential to understanding how to select consumer content to pique interest; more importantly, enhance their well-being. Prior to BPU Holdings in Seoul, Allison has worked as a Contemporary Art Advisor in Los Angeles and New York, a Contemporary Art Specialist and Consultant at Paddle8, Senior Contemporary Art Evening Sale Administrator at Sotheby’s New York where she worked closely with then Principal Auctioneer and Worldwide Head, Tobias Meyer. She has also worked at Philips Auction House in New York, and various Contemporary Art Galleries.